This award is the most prestigious of awards and is presented to the animal care and control/welfare professional who consistently goes above and beyond the call of duty and sets the example for his or her peers. Those who are awarded the John Rhodes Award exemplify the animal care and control profession through years of dedicated, professional service to their community and the profession; or have made great changes which impact and better our profession state-wide or beyond. Many past recipients of the John Rhodes Award earned the award after a life-time of dedication and service to their community, to the Missouri Animal Control Association or to the animals of our state. Nominees for the John Rhodes Award must be MACA members in good standing. The Animal Control/Humane Officer of the Year award is given to the Animal Control or Humane Officer who exhibits dedication to his or her community and brings credit his or her self and to the profession during the previous year. This award reflects, for example, an officer’s act of heroism, professionalism or dedication during in the performance of his or her duties, efforts to improve the quality of life of animals in the community’s shelter, or perhaps the officer’s efforts during a disaster. Nominees for the Animal Control/Humane Officer of the Year award must also be MACA members in good standing and have been working in the animal control/welfare profession for more than a year. The Animal Care Specialist of the Year award is given to the animal care provider or animal shelter worker who exhibits superior dedication to the animals in his or her care, his or her animal care facility and his or her community. He or she has brought great credit upon his or her self, his or her agency, and to the animal care and control profession during the previous year. Nominees for this award must be MACA members in good standing and have been working in the animal care and control/welfare profession for more than a year. is a shelter that exceeds industry minimum standard, either by implementing new programs, increasing adoptions, establishing spay/neuter programs, or by establishing public outreach programs. Nominees for this award must be licensed through the Missouri Department of Agriculture, must have employees who are members in good standing, and have been in operation for more than one year. This award is for a veterinarian who has provided exceptional service to an animal control or animal welfare program. Nominees of this award may be members of MACA but it is not required. 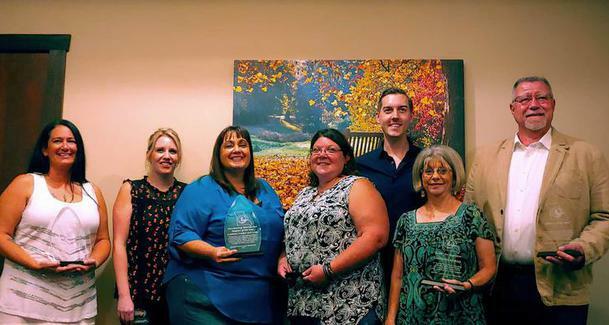 The Paws for Applause award is presented to a “friend of Animal Welfare in Missouri,” who has given of themselves as a volunteer, a donor or some similar activity, in a manner which makes a substantial improvement in animal control/welfare. Nominees of this award need not be members of MACA or have worked in the animal control/welfare profession.Thank you for considering submitting a nomination for one of our awards. Before submitting please remember that we must have the submitter's name and contact information so that if the Award Committee Chair has any questions or needs more information he/she can contact you. If you choose to do so you may remain anonymous to all except MACA Board of Directors. Please remember to make you nomination very detailed to give your nominee the best chance at winning an award. Nominations must be submitted electronically at or before 8:00 am August 1 of the calendar year.